Download "MSOW. MSO for the Web MSONet Workstation Configuration Guide"
2 Contents M S O W P H P W o r k s t a t i o n C o n f i g u r a t i o n G u i d e 1 Workstation Requirements... 1 Integrated PDF Handler... 2 Adobe Reader Settings... 3 Internet Explorer Settings Initial Login Workstation Requirements The following minimums are required for Practitioner Home Page use: 1. Microsoft Internet Explorer Web Browser versions 6-10 or Safari version 5.0 or higher or Chrome. 2. Screen resolution 1024 x 768 pixels or higher. 3. Adobe Reader 7.0 or higher. 4 M S O W P H P W o r k s t a t i o n C o n f i g u r a t i o n G u i d e 3 Adobe Reader Settings Users of Internet Explorer before version 9 must have the Adobe Reader installed. It can be downloaded for free from For users of other browsers MSOW from v2.4+ automatically uses the integrated PDF viewer and the following should not be necessary. For images and forms to function properly, ALL the Adobe settings following MUST be set as shown. NOTE: Administrative rights on the workstation may be required to control these settings. If you have trouble with this procedure contact your local I.T. support department. 1. 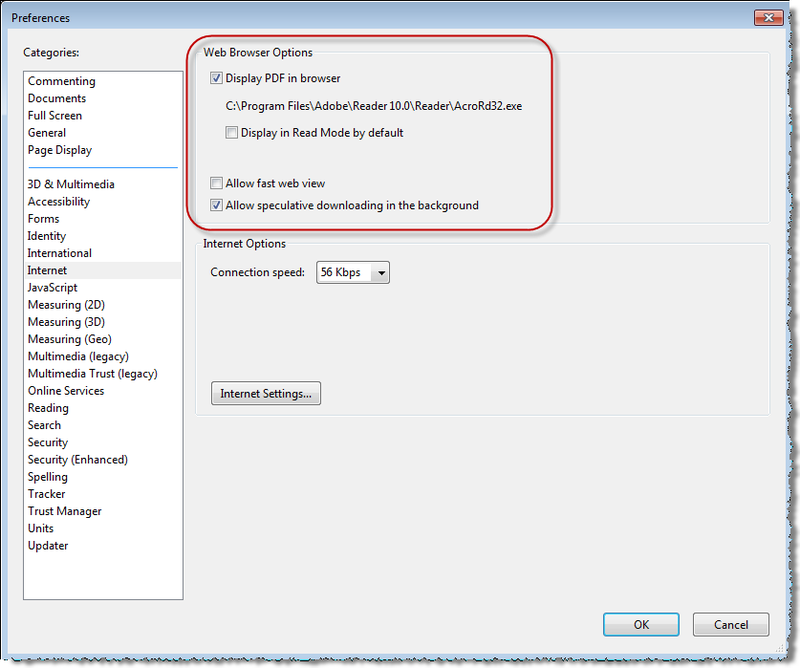 Start Adobe Reader (or Adobe Professional, as applicable) from your Windows Start Menu. 2. From the Edit menu, select Preferences. 3. On the left, select General. 4. 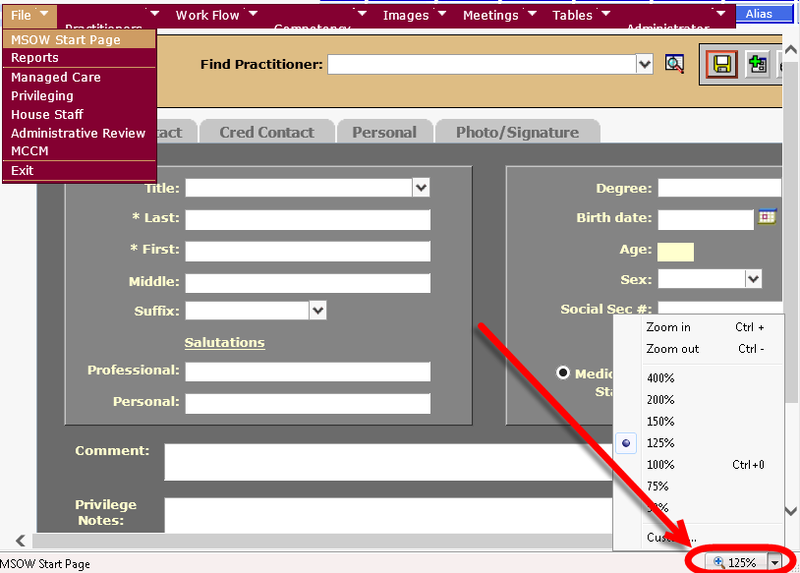 Under General, click the Select Default PDF Handler button, and confirm the setting. This appears in later versions if more than one handler exists and is critical if present. May not apply to all versions of Adobe Reader. 5 M S O W P H P W o r k s t a t i o n C o n f i g u r a t i o n G u i d e 4 Adobe Reader Settings (continued) 5. On the left, select Forms. 6. Uncheck the Keep forms data temporarily available on disk. box. May not apply to all versions of Adobe Reader. 6 M S O W P H P W o r k s t a t i o n C o n f i g u r a t i o n G u i d e 5 Adobe Reader Settings (continued) 7. On the left, select Internet. 8. Check the Display PDF in browser box. 9. Uncheck the Display in Read Mode by default box. 10. Uncheck the Allow fast web view box. May not apply to all versions of Adobe Reader. 8 M S O W P H P W o r k s t a t i o n C o n f i g u r a t i o n G u i d e 7 Adobe Reader Settings (continued) 16. On the left, select Updater. 17. Select Do not download to minimize unexpected disruptions. 18. Finally, click OK to save the Adobe settings. You may now close the Adobe program. 9 M S O W P H P W o r k s t a t i o n C o n f i g u r a t i o n G u i d e 8 Adobe Reader Settings (continued) The following check is typically required only if a user is experiencing problems. 19. Adobe has bugs, however version or higher is fine. Some Adobe distributions (such as CDs) may still include the version. In such cases, you MUST update it to a later version before use with MSOW. 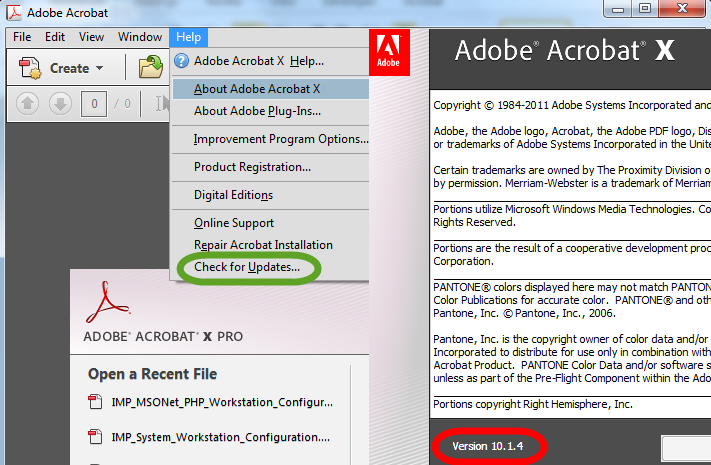 In Adobe, click Help > About Adobe Acrobat to determine your version. Click Check for Updates if you have the bad version. 10 M S O W P H P W o r k s t a t i o n C o n f i g u r a t i o n G u i d e 9 Adobe Reader Settings (continued) The following are typically required only if a user is experiencing problems. 20. Confirm file associations: Under Windows XP, check the PDF association: Open Windows Explorer (ie. My computer) Click Tools (menu), then Folder Options, then the File Types tab. Scroll down to PDF, check that they re associated with the Adobe READER program. Click Advanced, check that all actions are set appropriately; set Browse in Same Window Under Windows 7, check the PDF association: Open File Associations Control Panel: Control Panel\Programs\Default Programs\Set Associations Scroll down to PDF, check that they re associated with the Adobe READER program. Check other.pdf* extension variations as well for thoroughness. 21. Special setup if multiple Adobe versions present: If separate Reader and Pro versions are installed on same workstation: Set all details as described above in BOTH. Set the READER version for use in browser. 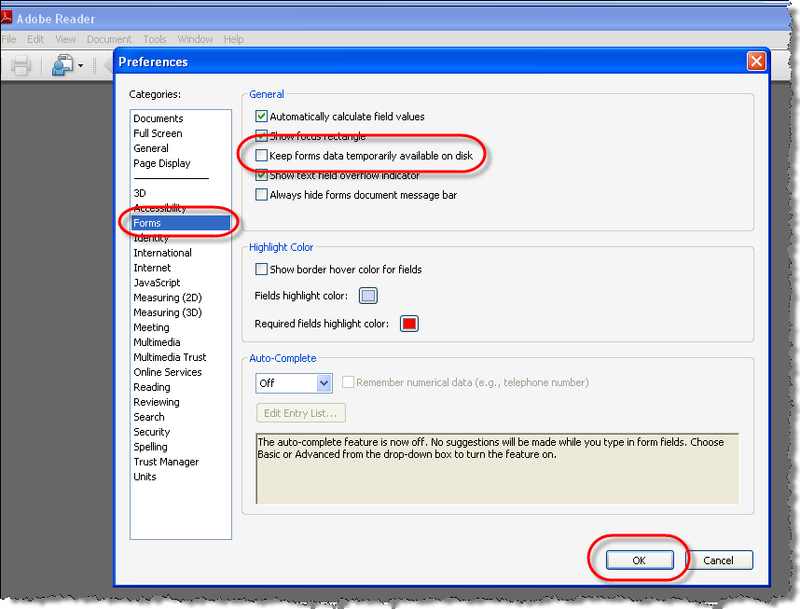 Confirm identical appropriate Select Default PDF Handler setting in both versions. 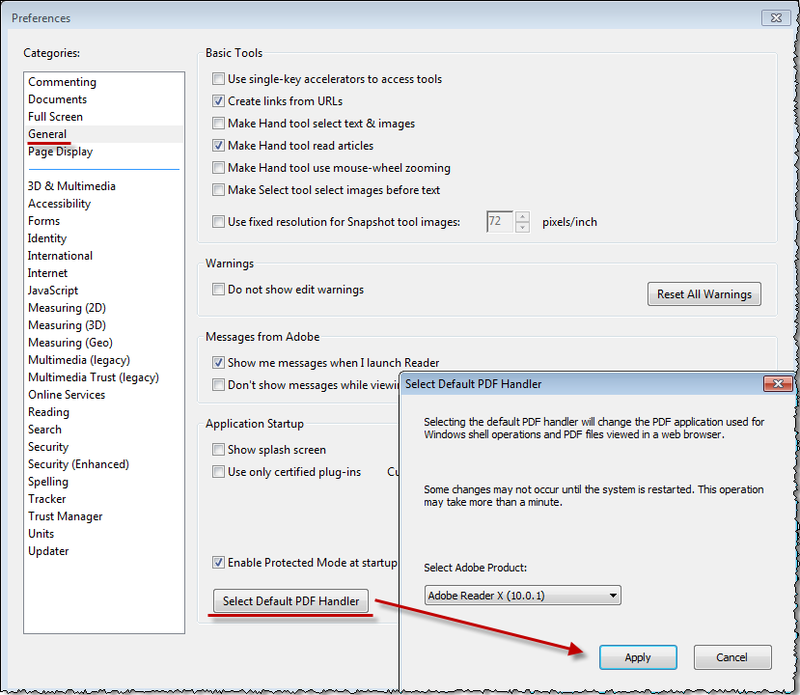 Set the Windows PDF file association as described above to use the READER version. Confirm which version is active by opening a PDF from within MSOW. Access the PDF s Adobe menu and check HELP to confirm the reader version. Set the Pro version to NOT be associated with PDFs, nor used in browser. 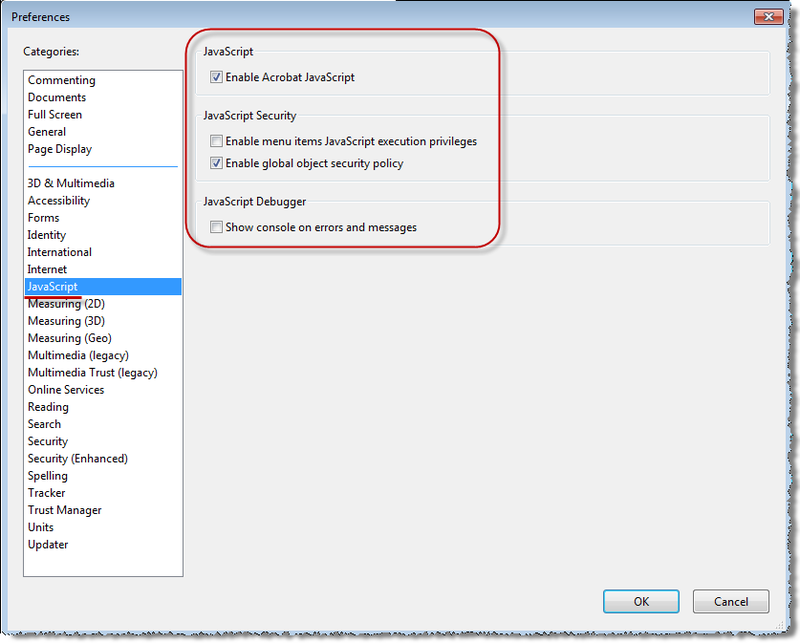 Form maintainers may then use it standalone from their Programs menu. NOTE: If the Pro version is newer, the older reader may be uninstalled. However if both are already installed, one must first uninstall both, then reinstall Pro. 11 M S O W P H P W o r k s t a t i o n C o n f i g u r a t i o n G u i d e 10 Adobe Reader Settings (continued) The following is typically required only if a user is experiencing problems. 22. Adobe set for enhanced security may give a warning when signing or submitting a form like: Security Settings on this document prevent adding text or signature. Signing not allowed. From the Adobe Preferences screen: Edit > Preferences > Security (enhanced) set Protected Mode to Off and Uncheck Enhanced Security. In some Adobe versions these options are on the Preferences > General menu. 12 Internet Explorer Settings M S O W P H P W o r k s t a t i o n C o n f i g u r a t i o n G u i d e 11 To function properly, MSOW requires that ALL the Internet Explorer settings following MUST be set as shown. NOTE: Administrative rights on the workstation may be required to control these settings. If you have trouble with this procedure contact your local I.T. support department. 1. From the Tools menu, select Internet Options. 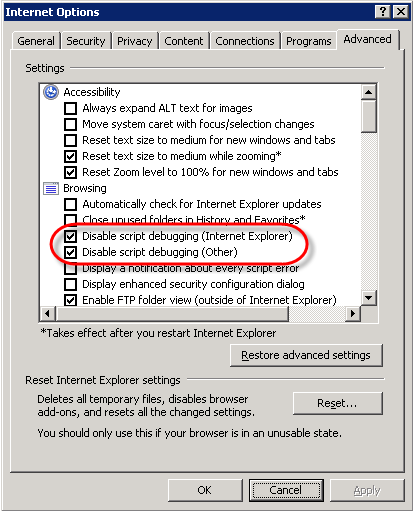 (Press alt to display the menu bar in IE 8) 2. Select the General tab. 3. 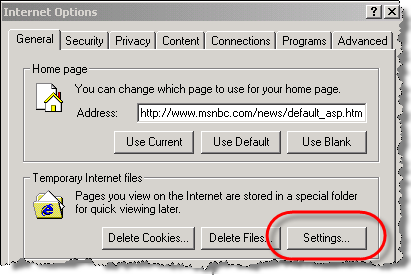 Under the Temporary Internet Files * section, click the settings button. * In later Internet Explorers this is found under the Browsing History section. 4. Select the radio button for Automatically And click the OK button. 13 M S O W P H P W o r k s t a t i o n C o n f i g u r a t i o n G u i d e 12 Internet Explorer Settings (continued) 5. Click the Advanced tab. 6. Under the Browsing section, select the Disable script debugging checkboxes. 7. Click the OK button. 1. To ensure the appropriate level of security, you will need Microsoft Windows XP or above. Installing and Configuring SQL Express 2008 R2 for Supply Chain Guru This document describes the process by which you can install SQL Server Express 2008 R2 and configure it for use with Supply Chain Guru. Online Payslip Self-Service User Guide Midlands, Midwest and Northwest Payroll Regions 1. Registration... 2 2. Activating your Online Payslip Account... 3 3. Logging In... 4 4. View Your Payslip... 5 4.1. PDF Bookmarks Help Page: When clicking on a Bookmark and Nothing Happens (or sometimes 'File Not Found' Error) Causes: Part 1: Acrobat or Adobe Reader has not been enabled to display PDFs in your Browser. In order to get the most out of your Bert Rodgers courses, it is important to ensure that your computer meets some minimum system requirements. Banner 7: What s New? What are the Browser requirements for Desire2Learn? AonLine System Requirements - Updated 8th June 2015 Introduction In order to be able to use AonLine in an optimal way and with all its available functionality, we require certain browser settings and software. How to File the FBAR Electronically. The following steps describe the process of filing an FBAR electronically with our system.